UPDATE 10/04/2015: Please note that my oven is an electric built-in oven, without fan. The fan tends to cook foods faster, so if your oven comes with fan, simply turn it off. 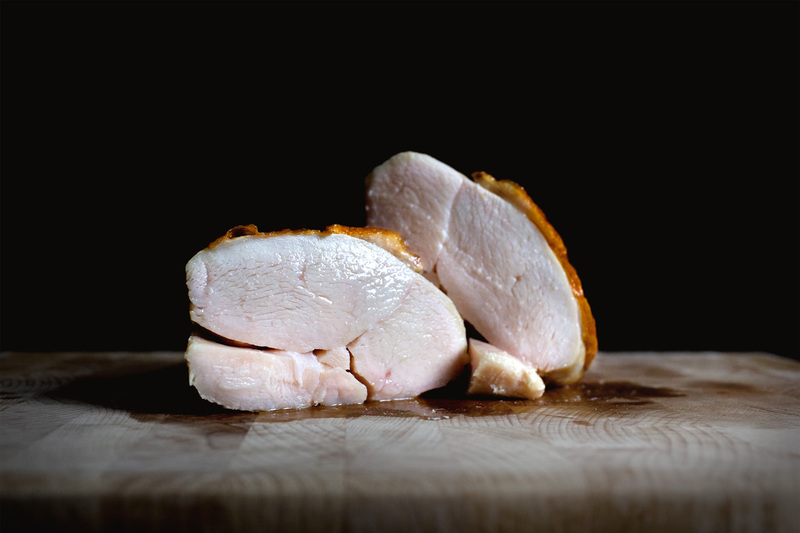 First, for chicken breasts, you can have them bone-in, bone-out, skin-on, skin-off, whatever. I personally prefer boneless, but skin-on chicken breasts. For each chicken breasts (not a “pair” of breasts but a single side), evenly rub 2 tsp of salt and 1 tbsp of neutral wine like Japanese sake, and let sit for 30 min. The salt seasons and draws excess water out of the breasts, bettering the flavours, and the sake gives the chicken a cleaner/more refined tastes. Rinse the chicken off of any excess salt then pat dry with a towel. 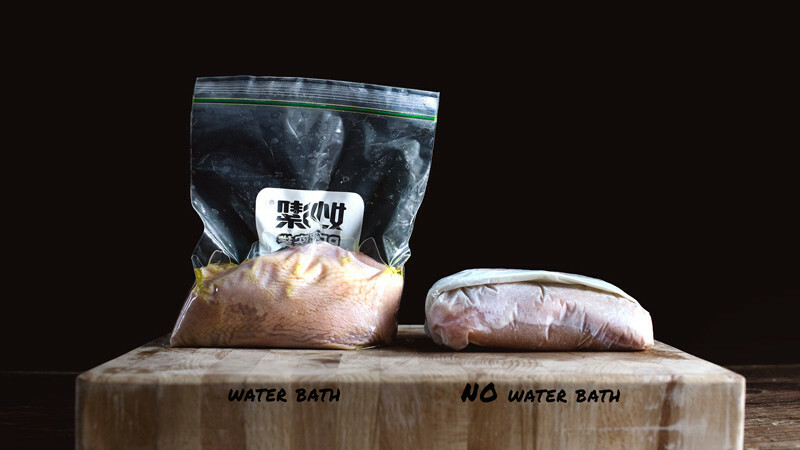 FOR WATER-BATH: place the chicken breast inside a zip-lock bag, then drizzle with just enough olive oil to coat evenly. Zip the bag until it’s 80% sealed, leaving a small air-slit. Then roll the chicken inside the bag tightly, squeezing out as much air as out of the bag as you can, then close the air-slit to seal the bag completely. 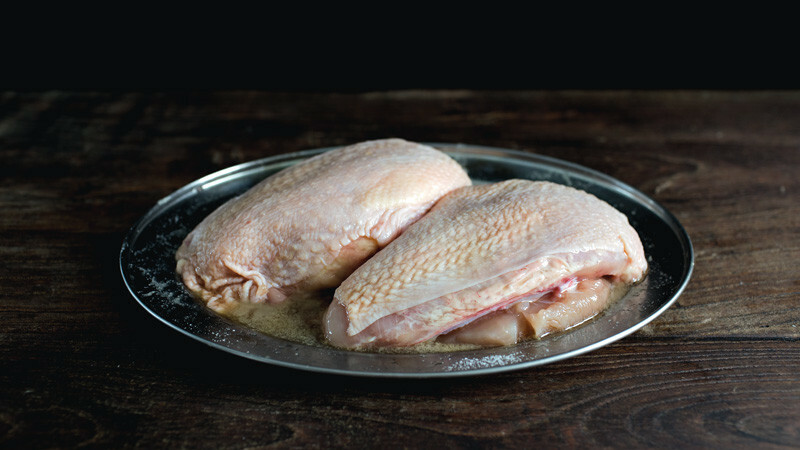 FOR NO WATER-BATH: place the chicken breast on top of a large piece of parchment, then coat it evenly with olive oil. Wrap the chicken tightly inside the parchment like wrapping a sandwich. 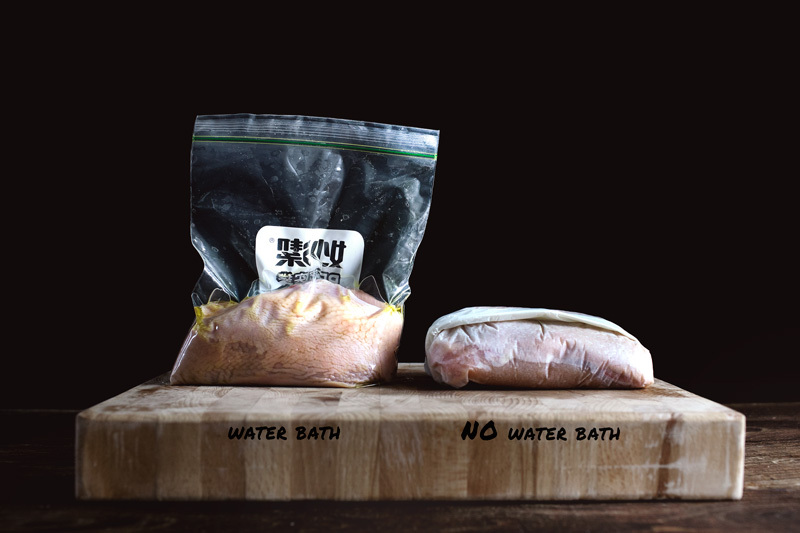 FOR WATER-BATH: We want to cook the chicken breasts in a 150 F/65 C water-bath for 1:00. 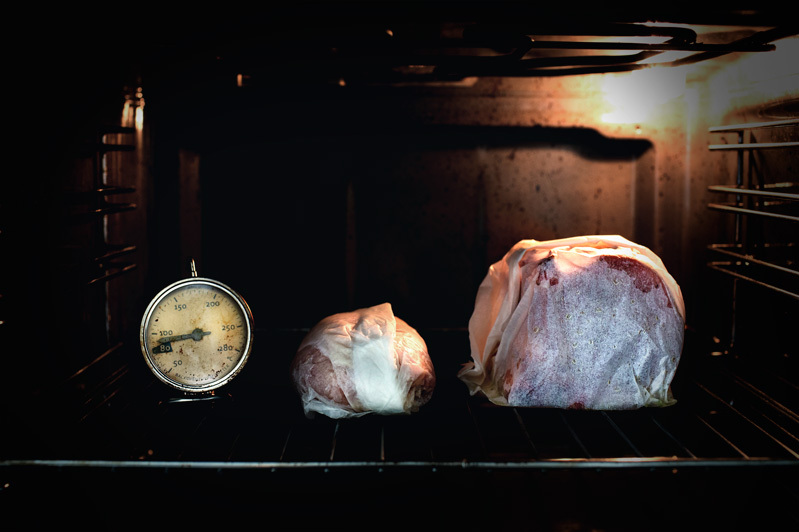 Preheat the oven 30 min ahead of time until the oven thermometer reads and stays at 175~185 F/80~85 C (the oven-temperature needs to be higher to make up for the heat-loss that goes into cooking the meat). Every oven is different, so you’ll need to get to know your oven a little. ALWAYS GO WITH THE TRUE TEMPERATURE ON THE THERMOMETER, and not the oven setting. My oven usually starts at a lower temperature when the preheating-light goes off, but then the temperature goes up pretty accurately after a 30 min of preheating-time. Meanwhile, tie the water/meat thermometer to the pot so it doesn’t fall, then fill the pot with the hottest tap-water (which is usually around 120F/50C). Heat the pot of water on the stove until it goes up to 155 F/68 C, then turn off the heat, and slowly submerge the chicken inside the bag, into the water (DO NOT do more than 2 breasts at a time). The temperature will drop back to 150 F/65 C, which is what we want. Now transfer the pot into the preheated oven. Close it. Then set the timer for 1:00. You may need to come back to it once or twice to monitor the temperature for the first time, but once you find the “sweet spot”, it’ll all be effortless. 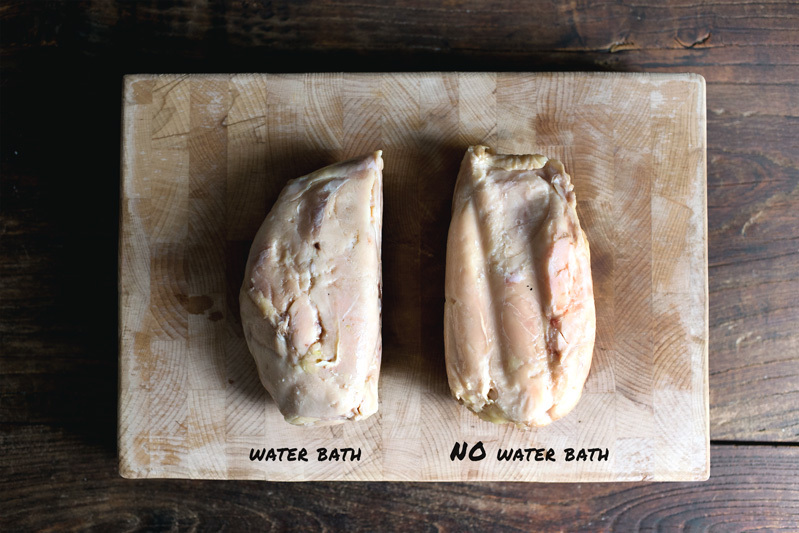 FOR NO WATER-BATH: We want to cook the chicken breasts in dry heat, at 195 F/90 C for 1:40. Air conducts heat not as well as water, so the temperature needs to be slightly higher compared to a water-bath, and the cooking-time a bit longer. But I prefer this method, which in m opinion, is fuss-free and easier. Preheat the oven 30 min ahead of time until the temperature reaches and stays at 195 F/90 C. Again, always go with the true temperature on the thermometer and NOT the oven setting. Now, without any baking-sheet or pan, place the parchment-wrapped chicken breasts directly on the middle baking-rack (with the skin-side up if your chicken has skin)(that thing on the right was a pork-chop, which is another post). Then set the timer for 1:40. 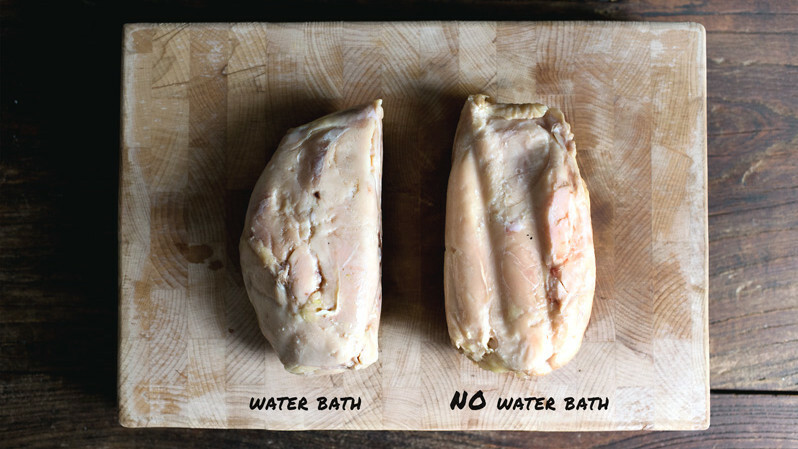 Remove the chicken breasts from the bath or oven after cooking, and let rest for 15 min. As you can see, there’s very little difference on the appearance of the cooked chicken breasts, except for the dents from the baking-rack for “no water-bath”. 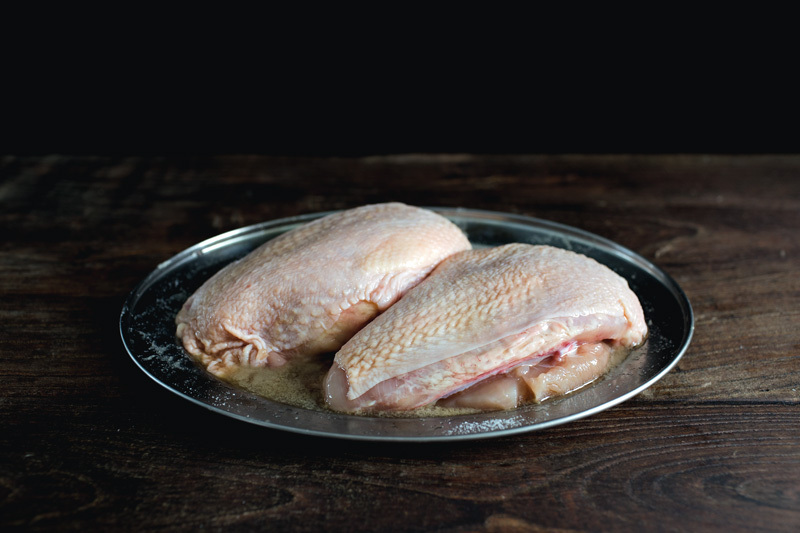 Now if you used skin-on breasts, crisp up the skin in a hot skillet until golden browned. What’s great about this method is that you can cook the breasts the day before, then crisp it up/warm it up before serving. I mean can you tell the difference? Which is which? Is this water-bathed? Or no water-bath? Or is this one water-bathed? Or no water-bath? …. Hmm… I can’t even tell! Okay okay, fine, the first one was water-bathed. Or wait, maybe the second one… Seriously, it’s very hard to tell. NOT CHICKEN I tell you, it’s not chicken. It’s something’ else. Alien. Now, the set of rules goes just the same as cooking salmon. 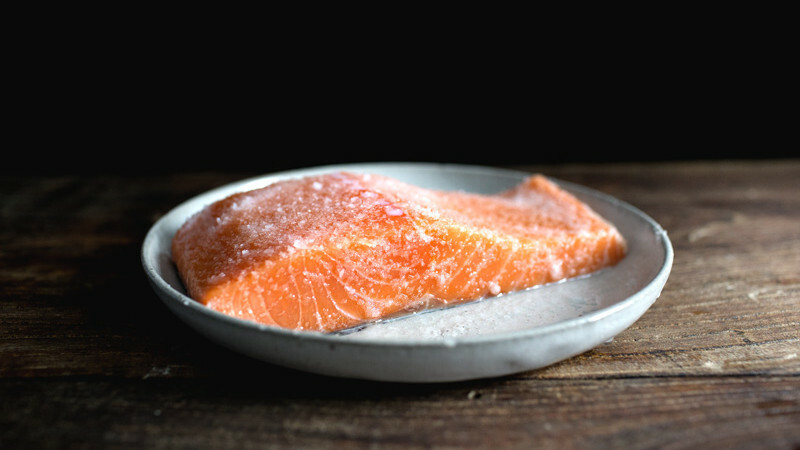 Rub 1 tbsp of salt on a mid-cut section of a skin-on salmon fillet, and let sit for 30 min. It draws the water out and seasons the fish. 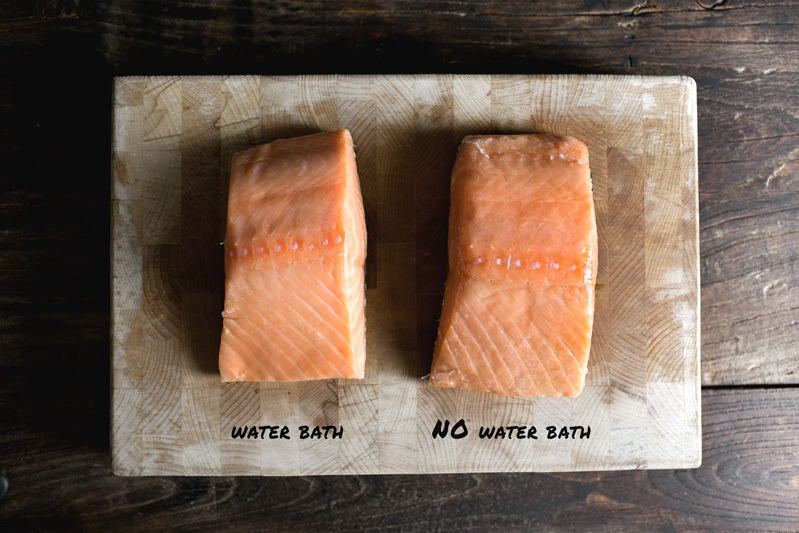 Rinse the salmon off of any excess salt then pat dry with a towel. 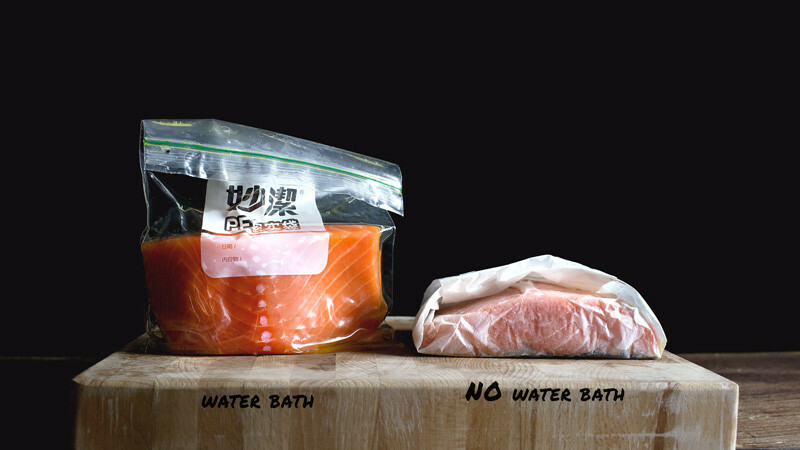 FOR WATER-BATH: place the salmon inside a zip-lock bag, then drizzle with just enough olive oil to coat evenly. Zip the bag until it’s 80% sealed, leaving a small air-slit. Then roll the salmon inside the bag tightly, squeezing out as much air as out of the bag as you can, then close the air-slit to seal the bag completely. 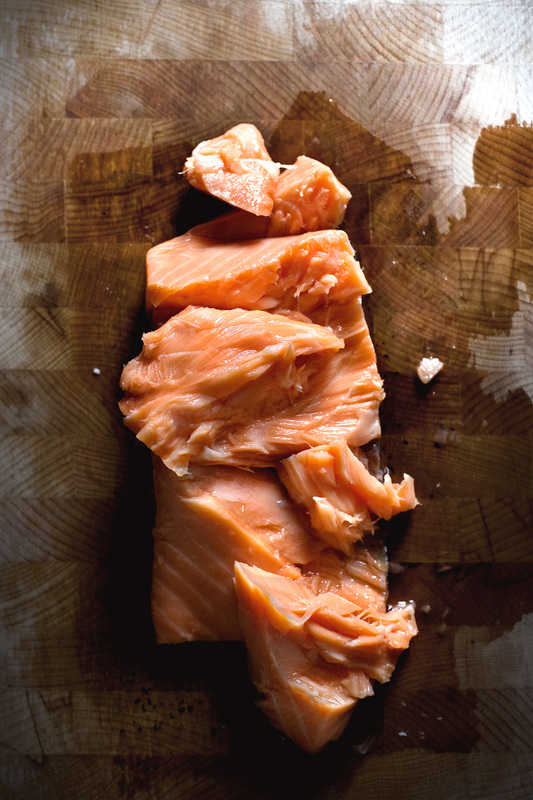 FOR NO WATER-BATH: place the salmon on top of a large piece of parchment, then coat it evenly with olive oil. Wrap the salmon tightly inside the parchment like wrapping a sandwich. 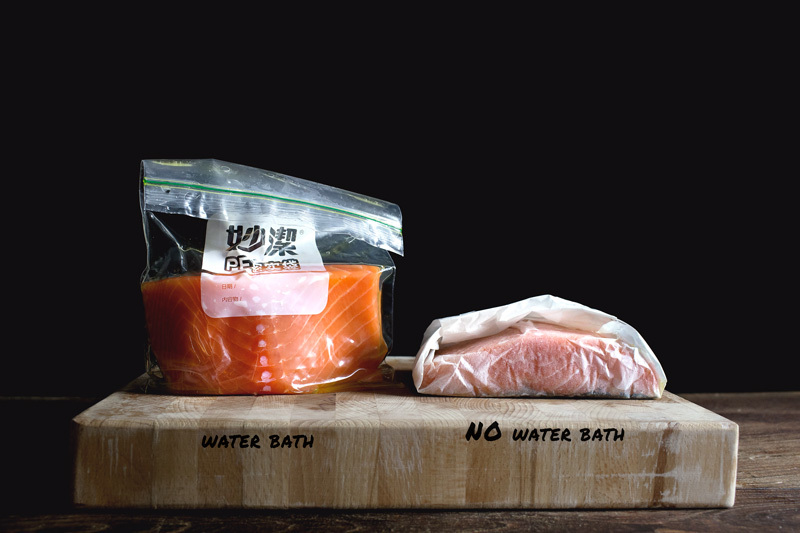 FOR WATER-BATH: We want to cook the salmon in a 120 F/50 C water-bath for 0:40 min. 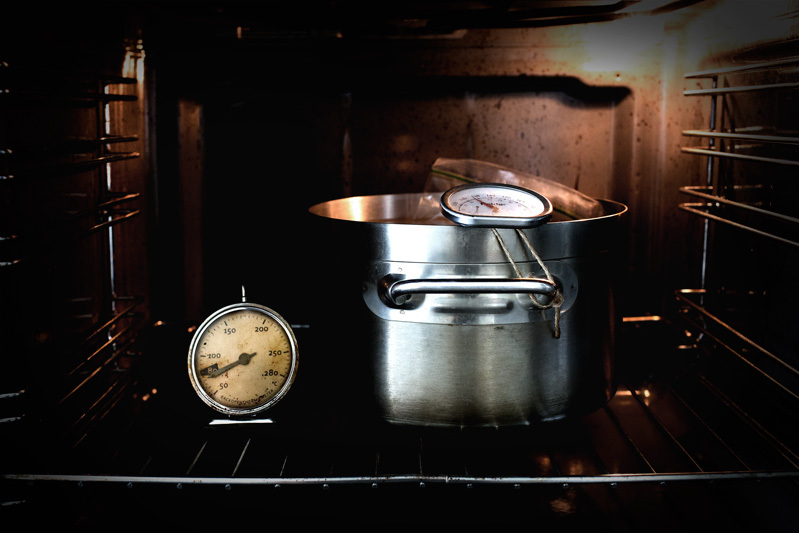 Preheat the oven 30 min ahead of time until the oven thermometer reads and stays at 150~158 F/65~70 C (the oven-temperature needs to be higher to make up for the heat-loss that goes into cooking the meat). The same techniques. Tie the water/meat thermometer to the pot so it doesn’t fall, then fill the pot with the hottest tap-water (which is usually around 120F/50C). 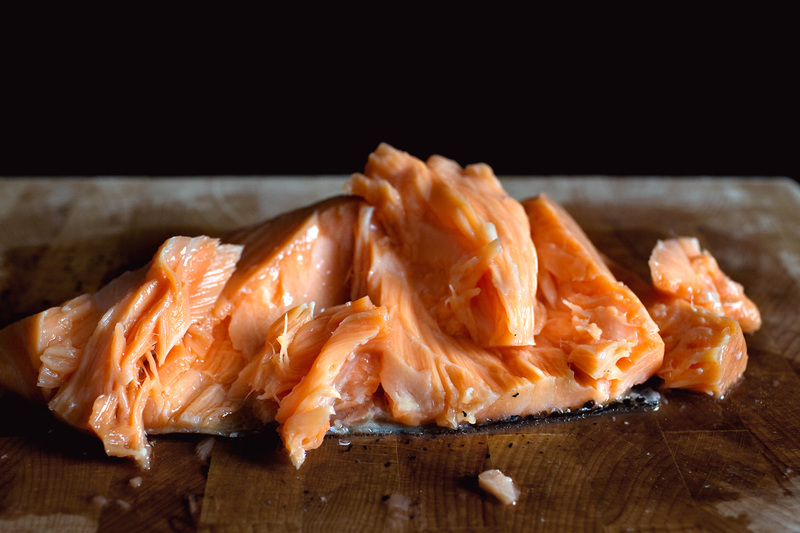 Heat the pot of water on the stove until it goes up to 127 F/53 C, then turn off the heat, and slowly submerge the salmon inside the bag, into the water (DO NOT do more than 2 salmon at a time). The temperature will drop back to 120 F/50 C, which is what we want. Now transfer the pot into the preheated oven. Close it. Then set the timer for 40 min. You may need to come back to it once or twice to monitor the temperature for the first time, but once you find the “sweet spot”, it’ll all be effortless. 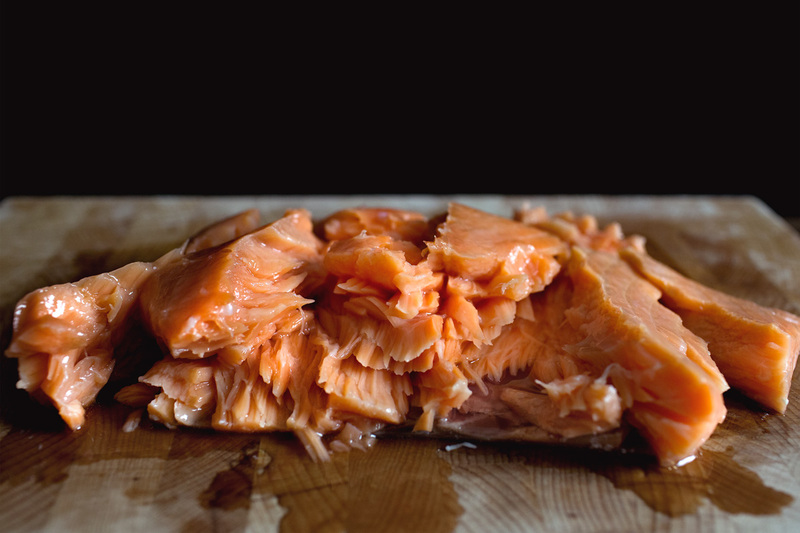 FOR NO WATER-BATH: We want to cook the salmon in dry heat at 150~158 F/65~70 C for 1:20. 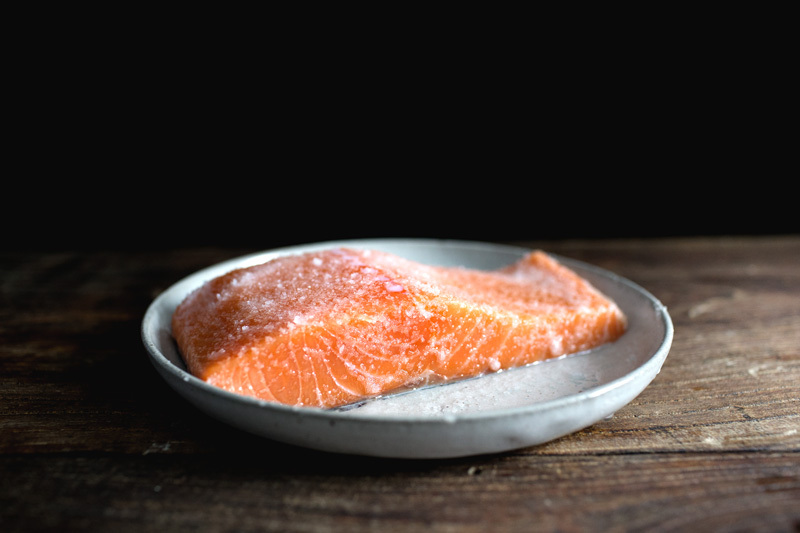 Preheat the oven 30 min ahead of time until the oven thermometer reads and stays at 150~158 F/65~70 C. Without any baking-sheet or pan, place the parchment-wrapped salmon directly on the middle baking-rack, with the skin-side down. Set the timer for 1:20. 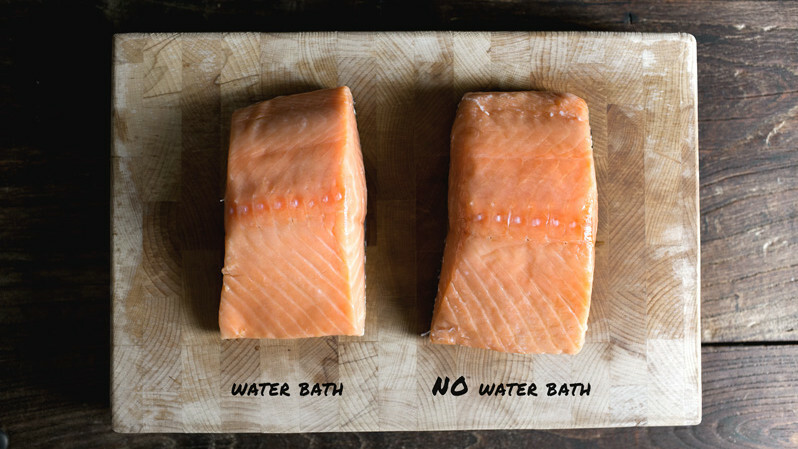 Remove the salmon from the bath or oven, and let rest for 15 min. This was cooked with water-bath. This was cooked without water-bath. Really, I have a hard time identifying the photos myself. Nothing but edible epiphany. I urge you to try this technique with this recipe. Crochet plate from Dishes Only. Now, the hot spring/onsen/soft-boiled eggs. 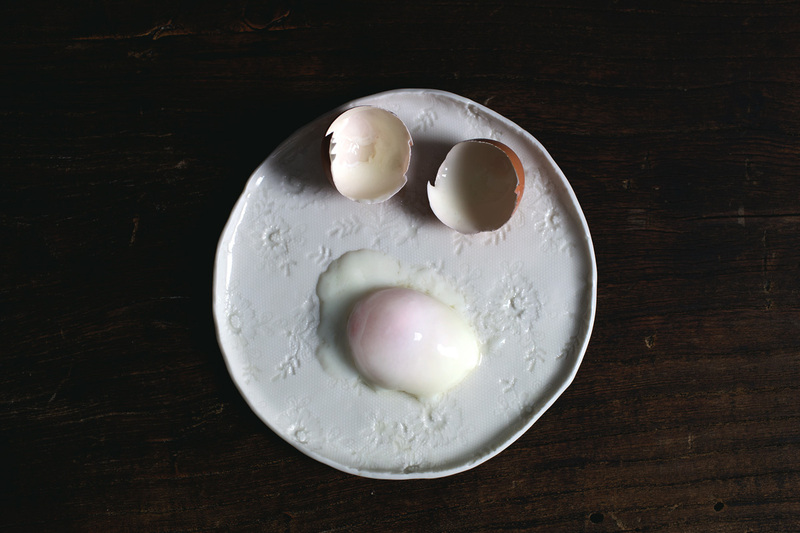 I already published a post on cooking these eggs on the stove, or using dry heat which I called sauna eggs (in a nut-shell, we want to cook the eggs in dry heat at 185 F/85 C for 0:53 min), so I won’t repeat myself. FOR WATER-BATH in the oven: we want to cook the eggs in a water-bath at 158 F/70 C for 0:23 min. 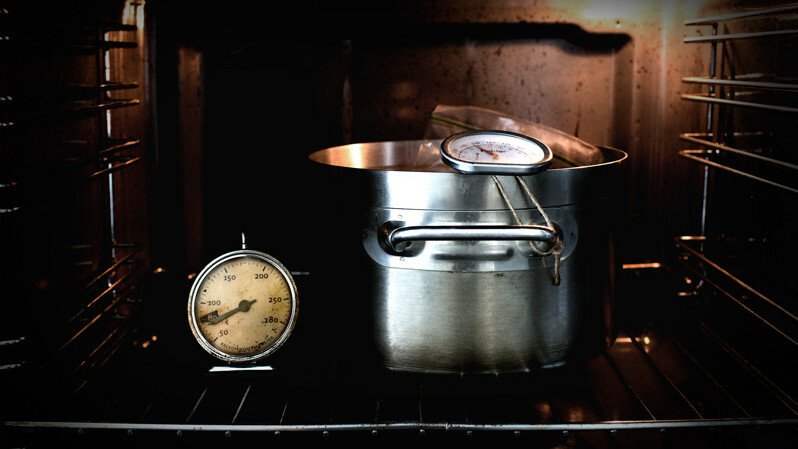 Preheat the oven 30 min ahead of time until the oven thermometer reads and stays at 185 F/85 C (the oven-temperature needs to be higher to make up for the heat-loss that goes into cooking the eggs). The same techniques. Tie the water/meat thermometer to the pot so it doesn’t fall, then fill the pot with the hottest tap-water (which is usually around 120F/50C). Heat the pot of water on the stove until it goes up to 163 F/73 C, then turn off the heat, and slowly submerge the 6~8 large eggs into the water. The temperature will drop back to 158 F/70 C, which is what we want. Now transfer the pot into the preheated oven. Close it. Then set the timer for 23 min. You may need to come back to it once or twice to monitor the temperature for the first time, but once you find the “sweet spot”, it’ll all be effortless. You can keep the cooked eggs in the fridge, and crack them as needed. This is so cool. I think you just touche-ed all the sous-vide enthusiasts that nothing can beat a sous-vide machine. I love how moist ans soft the meat looks. I will have to try it once. Thank you for this post! he chicken and salmon looks awesome, gonna try out the no waterbath method real soon! Why did I buy a sous vide?? Regrets… this looks incredible. thank you for sharing the technique! This is super cool. Thanks for sharing the comparison with us! I feel like you are my Hagrid and took me away from my muggle family to the Hogwarts. I’m interested to know, how in the world did you figure out the timing for the waterbaths? You are Dumbledore indeed. Will try the chicken tmw I can’t delay that. I hope to see in your next post Steaks, perhaps? i saved this so fast i made my computer spin. now i eagerly await the follow-up with something totally impossible to achieve: a tender eye of round roast. No need to check internal temperature of meat when it comes out? Such wisdom!! I cooked 2 breasts (we NEVER buy breasts) the dry method in parchment today for lunch. They were perfect and incredible….Now I can go back to buying whole birds. I cannot wait to see you unveil other meat cuts with this methodology. For anyone wondering, I followed instructions with salt and sake, and rinse, dry and they emerged perfectly seasoned!! Thanks! Trying the salmon first!! 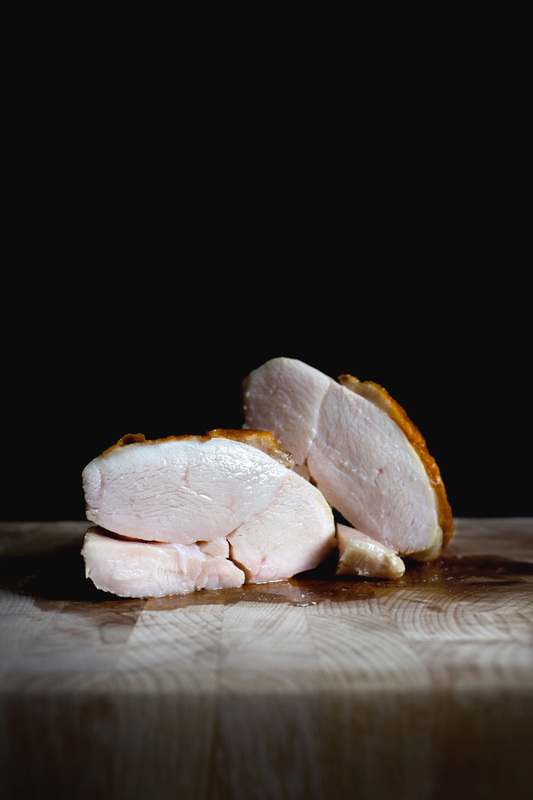 I have only tried once sous-vived cooked chicken and it was totally disgusting, it was crunchy and fleshy like eating raw chicken.. Since then when I see in menu anything sous-vived I just skip it. Am I missing something? Elisavet, I’m new to this method as well, but as far as I understand, even sous vide has degrees of preferred doneness. Perhaps you tried the minimally cooked timeline. This recipe cooked the chicken to perfect doneness to my opinion. Another thing is, some chicken comes with impure and unclean taste from the processing plants. I’m not saying yours was, but I think if you tried the salt, sake, and perhaps even some grated ginger to marinate it/drawing out excess water before cooking, you would find the chicken much more pleasant tasting. Elisavet, I think if you were worried about semolina, you should avoid sous vide chickens in general, because there’s really no guarantee. The chicken came out still pinkish even though it was fully cooked (I could easily cut through it with dinner knife). Or try to purchase from credible sources that you trust? thank you so much! Now I am fully covered and I will pass for sure! ;) But be sure I will be looking forward to reading the rest of your sous-vide adventures, as all of your posts! This is awesome!! I can’t wait to try those eggs especially. I used to work at a brunch place that would cook a bunch of eggs in a sous-vide machine before service. I always wished for a way to do it at home for a big brunch party. Thank you so much for taking the time to figure all of this out – and to document it for us! Hey Mandy, what kind of oven that you use? Cause I’m in the market for a new one. Thanks. Nina, my oven is an electric oven without fan (the kind that builds into the cabinet, usually under the microwave). I would buy a similar one if I’m tight on space. I would probably buy one with fan that could be turned off (as in this case). I’m so excited to try this. I have a bone in whole chicken breast marinating right now. Would the whole breastfeeding also take same 1:40 or needs a longer cooking time? Ruby, I think I would still start with 1:40, because the thickness of the breast doesn’t change. Add another 10 min if you find it insufficient. Wouldn’t foil work in place of parchment paper? If not why parchment paper? Rach, foil is a heat-conductor, and that’s another factor that we don’t want to monitor especially when a low and specific temperature is desired :) I hope that answers your question. I hope someone does Thanksgiving turkey with this method and reports back. I’m not doing turkey this year but I’d like to hear if it works! What do you mean by tightly wrapped? Should I ensure that every inch of meat is in contact with the parchment paper? Thanks! Mickey, which meat are you talking about? If you keep them in fridge, I wouldn’t go above 3 days just to be safe. If you freeze them, I’m not sure if the thawing process would cause the meat to lose moisture and compromise the texture of the meat (it might not, but I’m not sure). I would make a couple first and freeze them just for testing. I was just researching the machine, thinking, what the heck, it looks like a boil in a bag (I know really just heat at low temp in a bag) but $350 come on…but now what you are doing makes sense. PERFECT sense!! I am getting my French or something on and doing this. Thank you. I did have to increase the oven temp to 200 deg to keep the water at 150. Mind… Blown!!! The no water bath technique is genius and so much simpler. I need more!!! How did you come up with the temperature conversion? I’ve seen the Chef Steps Sous Vide Time and Temeprature Guide but I’m not sure how to convert it to the no bath water versions. I’m curious about the temps for different cuts of meat: rest of the chicken, beef and especially PORK!!! Mind… Blown!!! The no water bath technique is genius and so much simpler. I need more!!! How did you come up with the temperature conversion? I’ve seen the Chef Steps Sous Vide Time and Temperature Guide but I’m not sure how to convert it to the no bath water versions. I’m curious about the temps for different cuts of meat: rest of the chicken, beef and especially PORK!!! Roy, air conducts heat not as efficiently as water, therefore it requires a higher temperature than water bath. I mainly landed on the temperature by trial and errors. I been wanting to test more but have been busy :P. I will definitely do my best! hi, i can’t find neutral alcohols around my area (perhaps going a bit farther to some store that sells imported goods). Is there any substitute that you can recommend? Thanks so much Mandy! And congrats for finally leaving Beijing! Sarah, so sorry about the late reply. Perhaps a little bit of dry white wine? Wonderful guide, thank you! 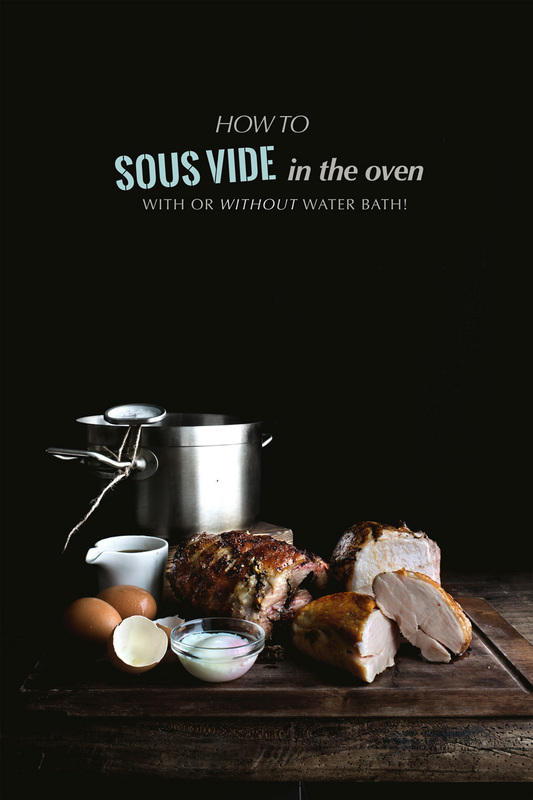 I haven’t even thought of doing Sous Vide without water as I’ve just been taught to do it with. Will definitely be giving it a go next time I cook a nice joint of meat. 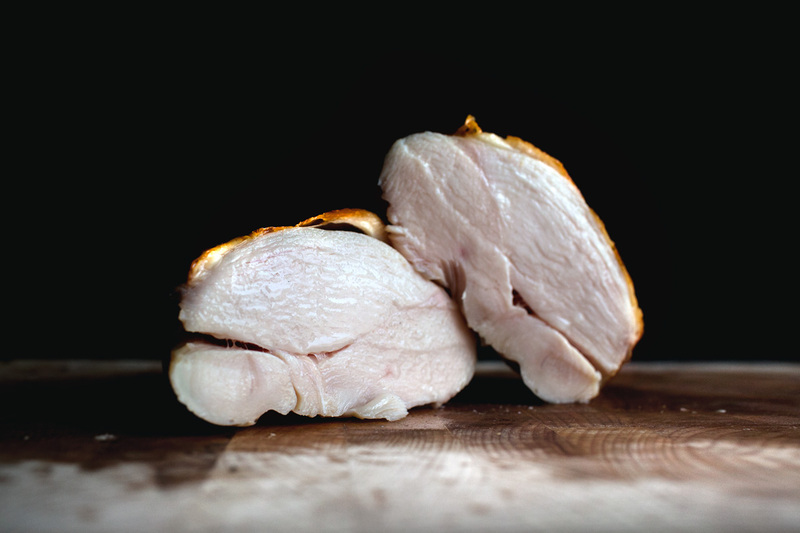 There are a number of Internet articles that talk about using your oven to try out sous vide. I guess I can see that But don’t think this is a convenient replacement for even a cheap sous-vide cooker. You could get better and easier results also with a ziplock bag, a $5 polystyrene ice chest, and your hot tap water. With the lid on this system will retain its temp within 1 degree for an hour – long enough for chicken, fish, or a nice steak. And honestly, I am able to see (even from the photos – which isnt even as good as seeing and tasting the really thing) that her true sous vide (which means with vacuum, and has nothing to do with water) dishes were a bit plumper and nicer colored. Also, try to use this non-water bag technic to cook something small, or some perfect eggs – it will not work. The other thing I can tell you as an engineer, is your paying at least 10x more to cook with or without the bag using an oven – using electricity to heat air to heat water to heat food. If you were to slow roast a pork shoulder for 48 hours in the oven in would cost a fortune this way – a few times and you could already pay for a home sous vive cooker ($99-$199). And ask your self why restaurants don’t use this method with an oven. So again, this is fine once or twice, but honestly I’d go with the ice chest method. Bizarro, your fire isn't unique, clearly, which is my point. Greg, perhaps you'd like to put forward an argument, rather than just abusing someone because you don't have anything useful to say. Are zip lock bags safe to use in the oven? pretty element of content. i simply stumbled upon your web site and in accession capital to claim that i get actually enjoyed account your blog posts. anyway i will be subscribing in your feeds and even i fulfillment you get admission to persistently quickly. This one is an inspiration personally to uncover out much more associated to this subject. I have to confess your knowledge prolonged my sentiments in addition to I am going to proper now take your feed to stay up to date on each coming blog posts you may possibly create. You’re worthy of thanks for a job perfectly achieved! 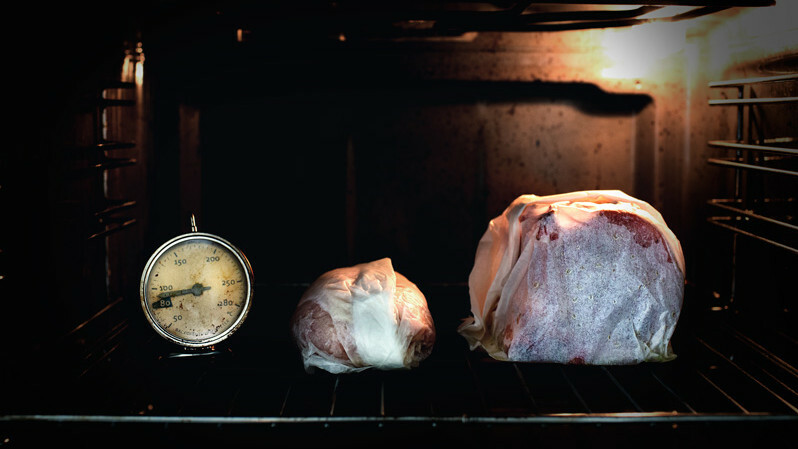 Why is it important to wrap every inch of the meat in parchment paper? What does it do and what happens if I leave an opening? Can I place as many pieces of meat as the middle oven rack can fit? Also, what settings should I use with pork loin chops if I am looking for an internal temperature of 135F-140F? Victor, the parchment protects the meat from drying (because it’s dry heat in the oven). I wouldn’t do more than 2 pieces of meat at a time because that may significantly prolong the cooking time and temperature setting (because more objects are absorbing heat at the same time and thus lowering the oven temperature). I haven’t come up with a recipe to cook pork chops by this method yet, but if I do, I’ll post it for sure:) Thanks~! Thanks for explaining! And I appreciate your quick response. This article is the reason I finally tried sous vide cooking! Thank you! Chicken held at 150 degrees Fahrenheit for 3 minutes would be safe to eat. This recipe seems fine, given the estimate of 45 minutes to thermal equilibrium in a water bath. Hi, I actually thought of this idea and tried it before I read your method. It didn’t work for me AT. ALL. I was so disappointed. Although, the lowest setting on my oven is 150 degrees Celsius, which is a huge difference from 50 degrees Celsius. I live in Australia. Do American ovens have a much lower lowest temperature setting? Oh I see… I don’t know what kind of oven I used to have. i noticed in a lot of recipes that require dehydrating, like fruit leather, the recipes are in Fahrenheit and it says if you don’t have a dehydrator, you can put it on the lowest setting of your oven, which is around 150 F or 65 C and the celcius ovens I have used all have the lowest setting well over 100 C, so that’s why I thought it’s an American thing. Thanks anyway and happy new year!